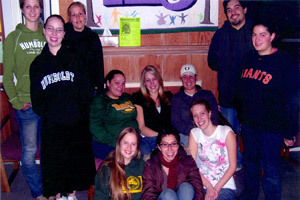 Volunteers of JHRP spend time with the incarcerated youth at the Humboldt County Juvenile Hall in Eureka, and provide outside community contact during regularly scheduled recreation time. JHRP volunteers provide support and positive guidance to the youth they serve in an effort to restore a connection to the outside community. Volunteers are available on Mondays & Wednesdays from 7:00-8:00 pm and on Sundays from 10:00-11:00am to interact with these youths however they can. Basketball, board games, and other games are available as outlets to an otherwise restrictive and monotonous routine. JHRP's work carries out highly set standards of exellence and integrity, marketing the value of community collaboration. Plans are being made to allow the youth to contribute to a poem book and/or an art book, and participate in some arts and crafts. Ray Watson from Humboldt County Juvenile Hall has been the person who coordinates contacts with employees at the Hall to schedule service hours provided by the volunteers.